and the 25ml bottle 225 shaves. small packaging that is entirely recyclable. and was thinking I'd only get one shave out of it. would last for 90 shaves. On using the shaving oil I found that the smells was what I could only describe as "clean" and "minty". I can honestly say that 3 drops was enough which I did find a surprise. and once applying the oil massaging it into your legs. So a little does go along way. Why not check out Total Shaving Solutions shaving oil or follow Tom over on twitter. 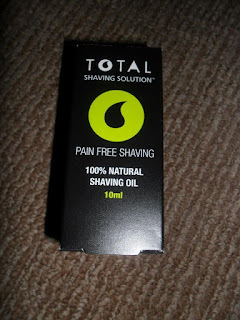 You can also find shaving tips for men and for women over on their website.